Welcome to the Season Extension Techniques pages! There are three pages in this section; click on the green "Pages in folder" menu, to the left, for photos and commentary covering previous years, or to book a Consultation, Presentation, Tour, or Workshop, or to order our reference books. See our Events page (green Folders menu, left) for dates and details of presentations, tours, and hands-on building workshops. ColdFrames are just one method of growing and sheltering food plants for eating beyond the relatively short Canadian outdoor season -- during which they can be produced and maintained on their own, either in garden beds, in planters, or on decks. Season Extension Techniques involve a broad range of strategies applied to a specific range of tasty and nutritious edible plants. Season Extension Techniques mean growing in the ground in garden beds -- generally not in planters or on decks, nor in greenhouses whether in soil or as hydroponics (although for a far greater expense greenhouses work well, too). With our garden's outdoor techniques, no electricity is used -- this means no heat, no ventilation, no lighting -- just appropriate sheltering according to your specific environment and the season, including strategic watering, knowing the right foods to plant and when, and specific harvesting strategies. What is covered here is growing in actual garden beds - OUTDOORS - through all four seasons. The techniques displayed here (and many more simpler techniques used successfully in our garden for years) allow for planting some seedlings out earlier in spring, and for warming the soil and planting certain seeds directly in the soil much earlier in the spring than the traditional Toronto planting-out date of 24 May. Season Extension Techniques also allow for maintaining a range of cut-and-come-again food plants for eating from very early spring right through the subsequent winter, making the practice economical in terms of: 1/ use of space, 2/ physical effort in seeding, growing, and maintaining foods, and 3/ by significantly extending the harvestable quantities of many food crops. As well, by applying these techniques and using ColdFrames, more cool-season foods can be planted in the autumn, once heat-loving plants are finished, and others can be maintained for many more months than they would last on their own. This means it IS possible to grow and harvest many foods to eat virtually right through the winter - using only the powers of your imagination and the sun. The author of this site has been in the garden harvesting food every single week for several consecutive years without fail, and believes that winter gardening is the most easy and amazing delight. Opening a frame in the middle of an otherwise snowy garden in the middle of winter and going home with fresh salad greens is both a visual delight, and an assurance of the safety of plants that can be eaten raw, as well as fostering both organic soil practices and local food strategies. Winter growing is also simpler than summer gardening because of the reduction of weeds, birds, and rodents, and because the limited watering required can largely be applied by Mother Nature. The growing applications shown in the Virtual tour, below, are only a few of the techniques and strategies to apply. This page is designed to make things look easy -- and such growing is relatively easy -- but there are many more details than show here. Soil solarization; building materials, designs and methods; frame placements; what to plant where and when; watering strategies; harvesting strategies; dealing with insects and rodents; ventilation; and extra heat-retention strategies are among the topics covered both in my book and at presentations and consultations. For more on that, see the "Tours and Books" page in this folder, and the "Events" folder. 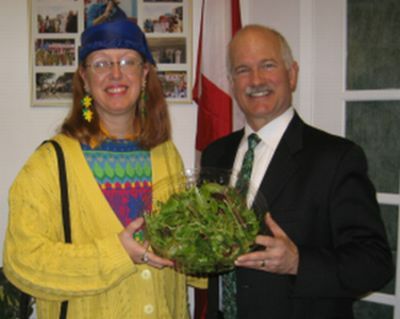 Sharing freshly-picked, local, organic salad greens at Jack Layton's Holiday Party. our Hundred Footstep Diet, where greens are safest to eat raw because those doing the growing are enjoying the fruits - well, veggies, actually - of their own labour. Seven feet of snow fell on Toronto between December 2007 and March 2008. This page documents seeds planted that fall, when we pulled out the heat-loving vine crops to make room for produce to eat through autumn and the winter. With the very mild weather throughout April, we were hardly able to keep up with the growth of the fall seedings, and we planted pea seeds that, on the first of May, are more than two inches tall. Winter 2011 through the end of March 2012 was positively balmy -- a real anomaly for Toronto, with some record-breaking highs of 26 C, followed by freezing and snow warnings as we reached April. 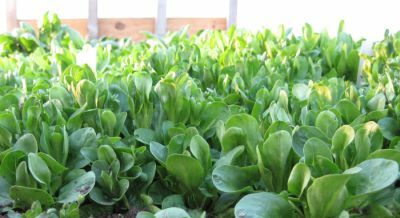 Leafy greens overwintered in ColdFrames have threatened to bolt to flower and seed; while seeds planted in late February reached two inches high by the end of March. Perennials like sorrel are up and abundant. Other leafy veggies that self sow are showing colourful growth, and it's good we have extra frames with which to cover them given the wide swings in weather conditions. and my Hundred Footstep Diet is a great use of existing garden spaces! All photos on this website are protected by copyright laws. This intellectual property is for viewing purposes on this website only. Do not lift or copy any images or text without first receiving written permission. planted in fall 2007, over-wintered in a Tall Raised Bed.